BELIZE CITY–On Wednesday, December 3, police responded to a shooting on Wagner’s Lane, more popularly known as “Jump Street.” The Belize Emergency Response Team (BERT) ambulance that screamed its way down Albert Street moments after a police mobile unit, with siren blaring, had passed, drove back quietly on Regent Street as it made its way back to its base, an ominous sign of another fatality in the city — ambulances do not transport dead people. None of the residents of Jump Street who were standing behind the yellow police crime scene marker knew who the man was, who lay dead near the entrance to one of the network of alleyways that connect to Jump Street. The suspense about the identity of the victim was soon broken, as word began to spread that the man on the ground, who was shot once in the head, was Robert Tracy, a man from Gungulung who had strayed into Jump Street. After about an hour, the police wrapped up their work on the crime scene and a police vehicle made its way toward the body of Tracy which lay sprawled out in a pool of blood, as neighbors watched from doorways, windows and verandahs. Police covered the body and put it in the pan of the police pickup that would transport it to the Karl Heusner Memorial Hospital (KHMH) Emergency Room for it to be pronounced dead by a doctor. When she emerged from inside the KHMH Accident and Emergency Room, Sherian Tracy, 26, one of Robert Tracy’s sisters, sat down in the area of the ambulance ramp, hanging down her head, as she said, almost to herself, “da mi only big brother,” before she became overwhelmed with tears. While Sherian wept uncontrollably, three women walked in, one of them being held as she tried to control her tears. That woman was Helen Samuels, Tracy’s mother, and she and Sherian embraced tightly, as they both wailed in grief. Samuels would later identify her son’s body at the hospital’s morgue. Tracy was sitting on a stool and his assailant shot him once in the head, Martinez told reporters. “Tracy is no stranger to the authorities,” Martinez added. “He had quite a lengthy rap sheet; as a matter of fact, the last count we had was thirteen and these include burglary, grievous harm, wounding, theft, robbery and the list goes on. As a matter of fact, he was actually charged and convicted twice for drug possession, and I need to mention as well that previous to this he had three attempts on his life, including one that occurred on September 4, 2011, when he was shot in the thigh, buttocks and finger. This happened on Magazine Road,” Martinez said. He went on to add, “Then the other incident was on December 19, 2012. This time he was shot on Holy Emmanuel Street and this time it was his wrist. Following the police’s press briefing, some reporters set out to locate the murdered man’s home, which is nestled deep inside the Gungulung area of Holy Emmanuel Street, where access is gained by the crossing of a string of “London Bridges,” which stretch out over the mangrove swamp, the thick foliage almost concealing the plywood house from the outside world. At the house, Samuels, an employee of Belize Maintenance Limited (BML) who suffers from hypertension, was surrounded by her other children. The grieving family was having lunch. “Every day, my son tell me that he will die before me,” Samuels said, before the grief overcame her and one of her younger children was sent to fetch her a glass of water. “We were just talking to the media. They called me around 10 o’clock and told me that my son just died,” Samuels said between sobs. Three days later, she said, he was killed. “He’s home all day; he no go nowhere,” she sobbed. “But they said someone went to hail him here this morning and took him out so, but I don’t know who and I feel like they took my son to his death, because he doesn’t travel those areas,” she then remarked. 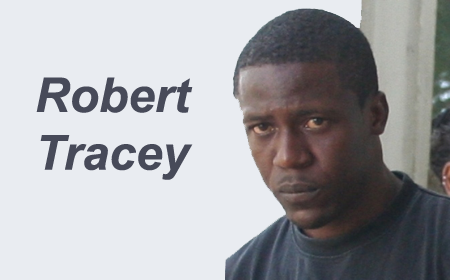 At the time of his death, Robert Tracy had secured Supreme Court bail for a pending case at the Magistrate’s Court. “Every time he been in jail and he come out, he try to behave himself. I just took him out of jail September,” Samuels said, before she had to be consoled once more. “I pay the money to make him come out of jail and so many times he come out of jail, the police always harass him. The last time they came way in my house and beat him up for nothing, for a little piece of weed. From the time he come out of jail, about 5 times my son went to the station for simple things. The last time one of them threatened his life,” she said. At the police press briefing, Inspector Romero could not say whether Tracy was a member of any of the city’s known gangs.